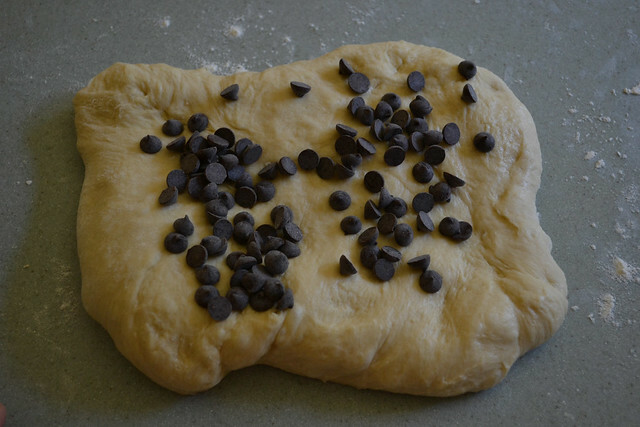 In my opinion, chocolate chips are SUCH a challenge in challah. They should be easy and perfect but they can often either overpower the bread or become burnt little crisps. I've mentioned this before, but my solution is to knead in the chips AFTER the rise(s). First, I sort of flatten the bread, as such and drop a bunch of chips on. This is about a quarter of a cup. 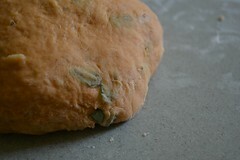 Knead those in gently and then add more to your liking. When I separate each strand for braiding, I try to make sure there are no chips on the outside. It's challenging to do, because they want to poke through. 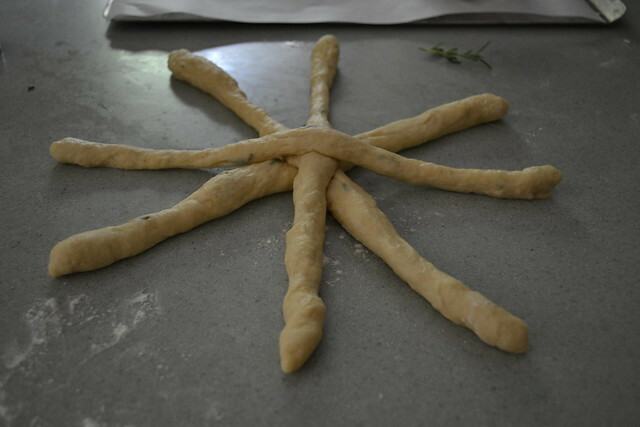 I do my best to work them into the center of the dough. With chips of any kind, I find that fewer strands is best. 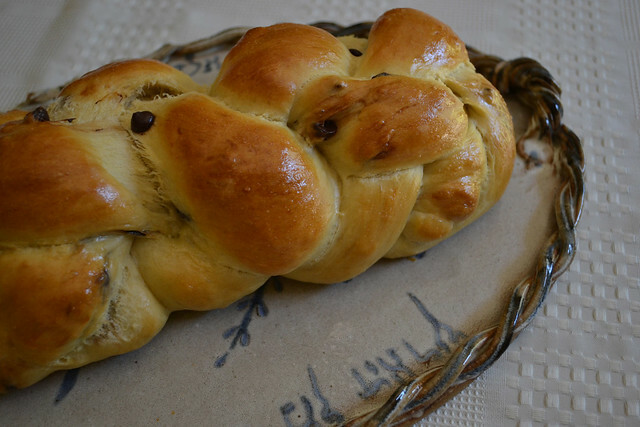 In filled challot (like Nutella Challah), I always do three-strands. 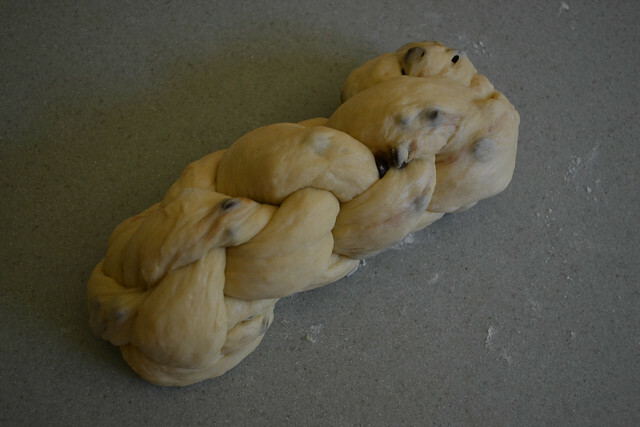 With the chocolate chips, I opted for a four-strand, which I don't do very often. This is mainly just because I prefer five. 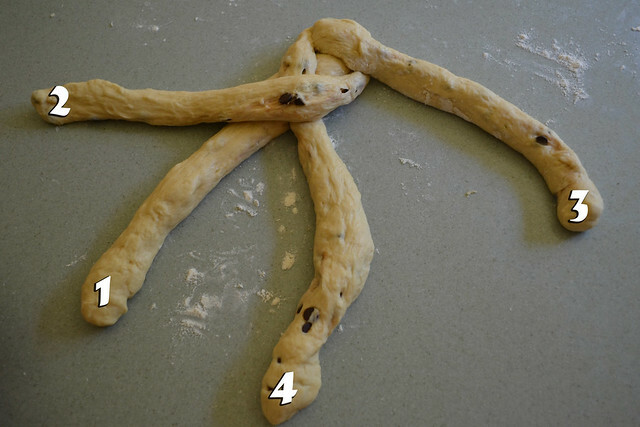 But, here's my how-to on four-strand. I learned it from a friend. Five I learned from the internet, so I'll try to dig up the link... if I can't find it, I'll post my own but it's a little hard to photograph! Step One - Lay your strands out and gather at the top. 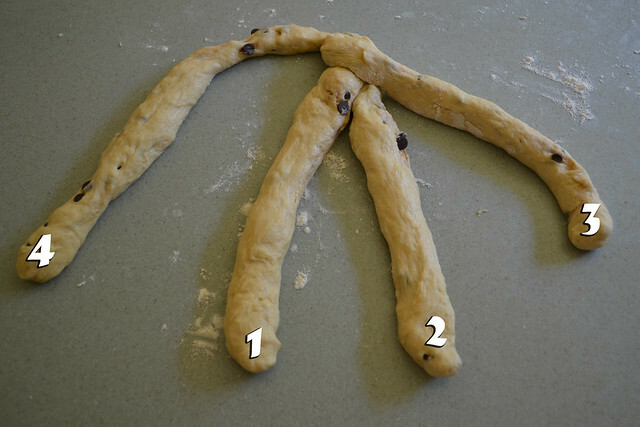 They are numbered 1 - 4 right to left (it's Jewish bread after all). Step Two - Bring #1 over #2. 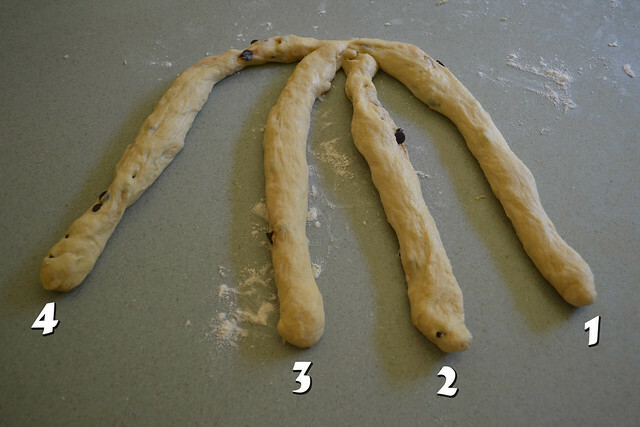 Step Three - Bring #3 to the far right, over #1 and #2. 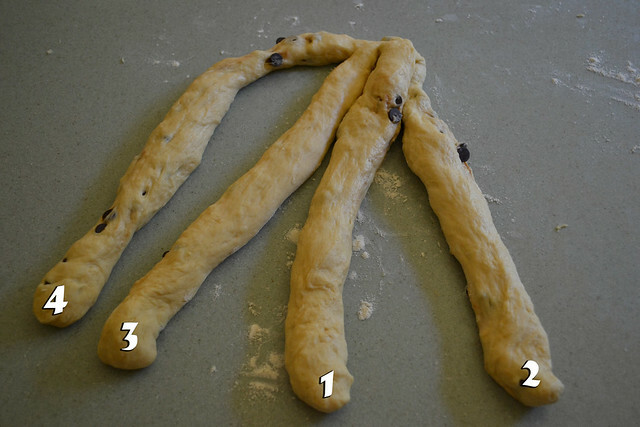 Step Five - Bring #2 to the far left, over #1 and #4. Repeat steps one through five. - With all my challot, I tuck a good portion of the end under and use my palms to push the loaf together lengthwise because I like a short, high bread. If you like a longer, flatter loaf, you don't need to do this. Ta-da! You did it! 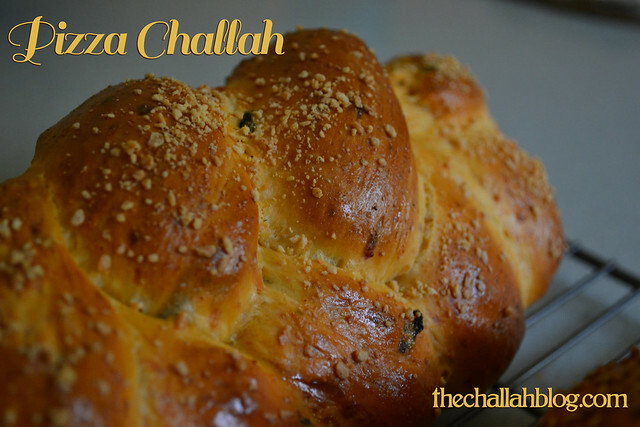 I love chocolate chip challah, and I'm excited because The Hazz's cousin and her family are coming to visit with two little daughters! Love making kid-friendly dinners (although this week, The Hazz cooked and I just made challah and dessert). 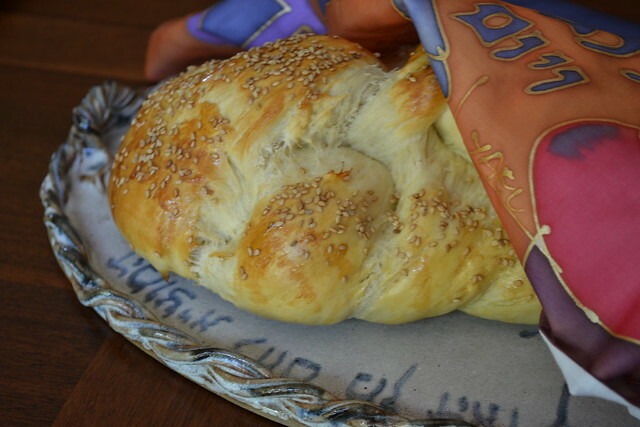 Shabbat Shalom from our bayit to yours! 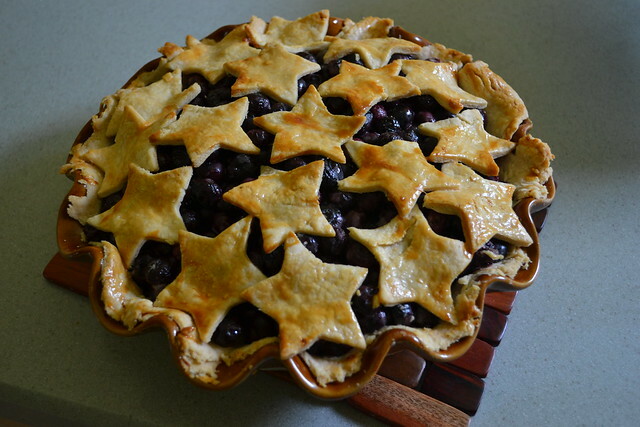 In case you're wondering, I bake other things too. A few weeks ago, I spotted a little block of fresh yeast nestled in between the eggs and the cottage cheese at my local grocery store. Excited, I dropped it in our cart and brought it home for some experiments. Our recipes call for fresh or dry yeast. 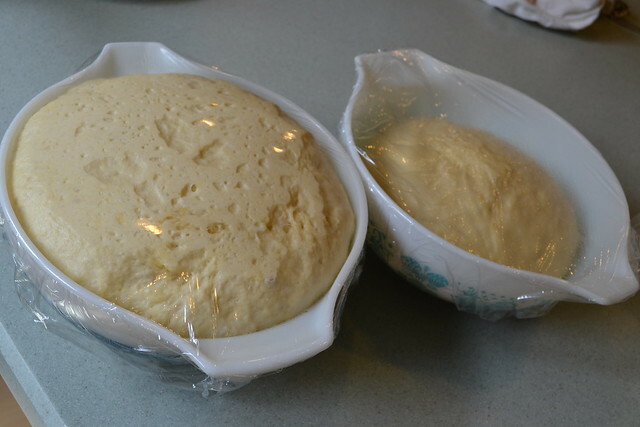 To substitute one for the other: One cake compressed fresh yeast (.6 ounces) equals one envelope (1/4 ounce or 2 1/2 teaspoons) active dry or instant yeast... Fresh yeast, also known as compressed yeast... should be smooth, relatively dry (not soggy), and free of any mold. A good test of freshness is to press a piece of the yeast between your fingers--it should flake and crumble easily. If there is any hint of gumminess or moisture, the yeast is probably past its prime. Both fresh and dry yeast should be stored in the refrigerator to maintain their potency. The process [rising] is as old as baking--that is, thousands of years--but it's been understood only since the mid-nineteenth century, when o' Louis Pasteur discovered that yeasts are living, single-cell fungi that produce carbon dioxide through fermentation (baking and brewing have a lot in common). Before then, most breads were risen with sourdough starters, which contin wild yeasts, but shortly thereafter commercial yeast production began. Now, of course, you can buy yeast in various forms at the supermarket, including fresh, active dry, and instant, which is the most recent addition to the group and bay far the most convenient... 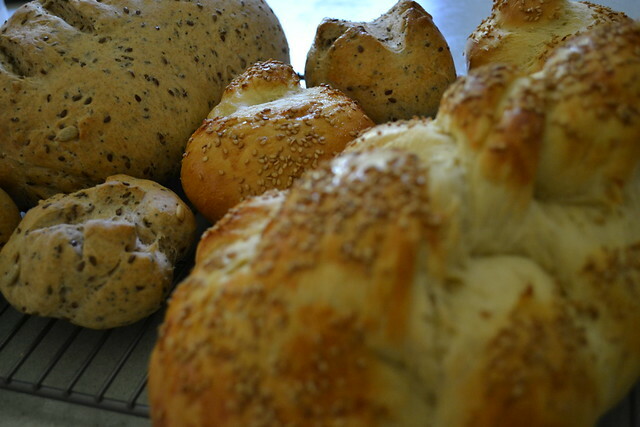 Many bakers contend that fresh yeast tastes better than dry, but I don't see it. It is kind of fun to work with, but for me instant is the way to go. So, using Martha's measurments of .6 oz equaling 2 1/2 tsp active dry (what a coincidence), I divided my 1.8 oz block into three and made three weeks worth of fresh yeast challah. 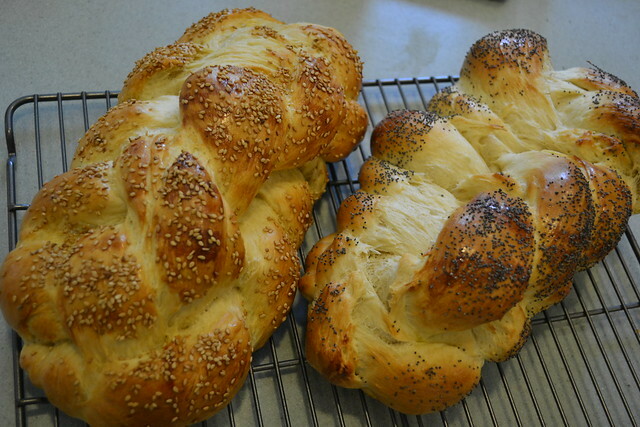 Week 1 - Made alongside Hippy Dippy Flax Seed Bread, this was our actual challah for Shabbat. It seemed to rise "faster" to me, but it was very, very hot at home, so I couldn't be sure. Fresh yeast has a ripe, yeasty flavor (duh! ), that reminds me a lot of beer. 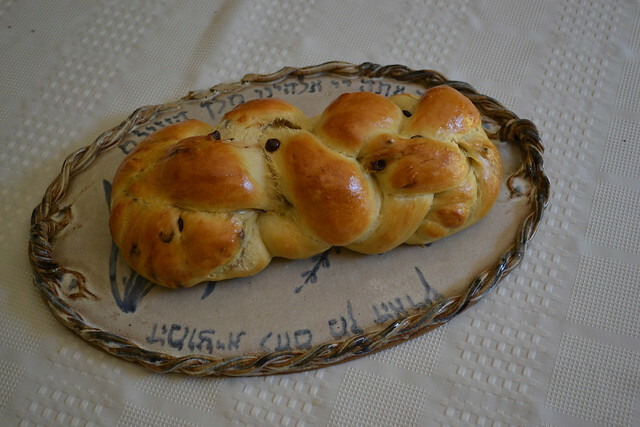 Week 2 - Made alongside Double Chocolate Challah, wooza! I left for a haircut and came back an HOUR AND A HALF later (short rise!) to find this explosion. 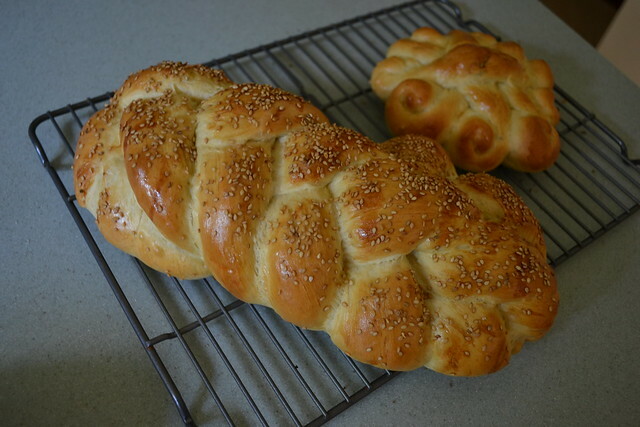 A quick braid and second rise (maaaaybe 25 minutes, again, quick), baked. Completely golden. 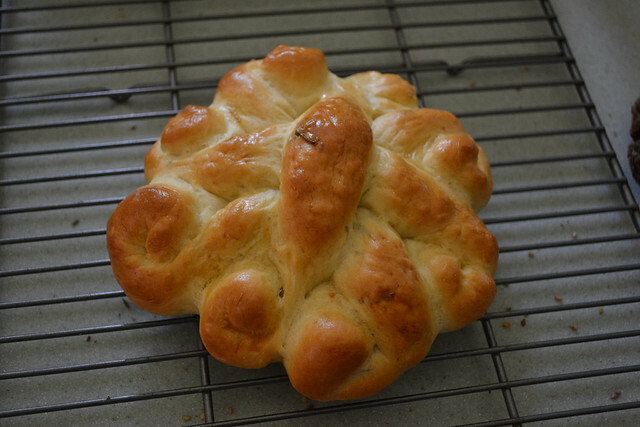 This time, we decided we really noticed a qualitative change in the challah. Softer, yeastier (again with the uncreative adjective), and yet a more delicate yeastiness. It's hard to describe. It seems very yeasty but it doesn't taste overly yeasty. If you've ever accidentally used too much yeast in bread, you know what I mean. The dough felt pretty much the same. To keep everything very standard, I used the same baking sheet. 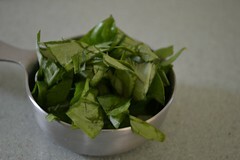 The active dry continued to rise while the fresh was in the oven, until it appeared to the same size in the bowl. Once baked, side by side, the loaves do look different. 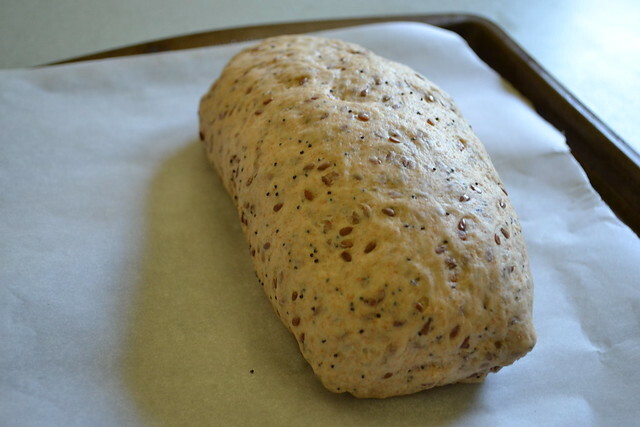 The active dry (with poppyseed) sort of collapsed open in the oven and isn't quite as lovely. At the Shabbat table, we tasted and compared. The Verdict - Side by side, the fresh yeast tastes better. As I said, it a mild, but stronger yeastiness. The texture is a little "doughy-er" which I like (both were baked to around 185 degrees in the center). Fresh yeast certainly isn't all that more expensive when you're talking about 50 cents per loaf. That said, my friend pointed out that her giant bag of active dry from Costco can last several months. I'm planning on buying fresh yeast when I can. But, honestly, you're not really missing much if you don't want to bother with it. It's worth trying for fun and I'd definitely be interested in experimenting more with it for more "pure" breads like baguette and things where there isn't honey and eggs in the equation. Have YOU ever used fresh yeast? Have any other secret yeast tips? Here is a neat star I made last Shabbat. 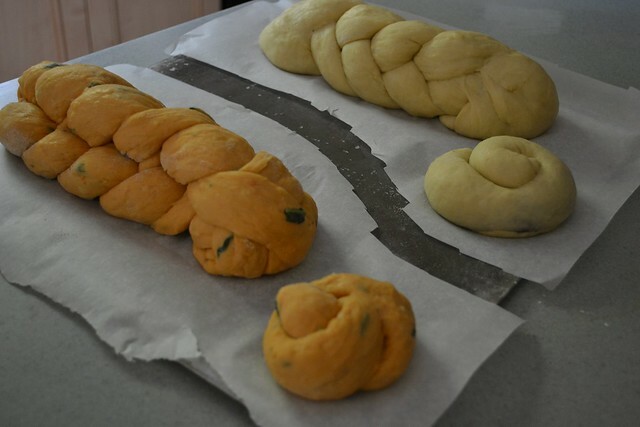 I learned this method in A Blessing of Bread: The Many Rich Traditions of Jewish Bread Baking Around the World by Maggie Glezer. The author writes that it isn't really a "Jewish shape" but when done with three strands it becomes a "Baroque Star of David." Silly me, I made it with four strands. So it's not a star. But it was still pretty neat!!!!!! 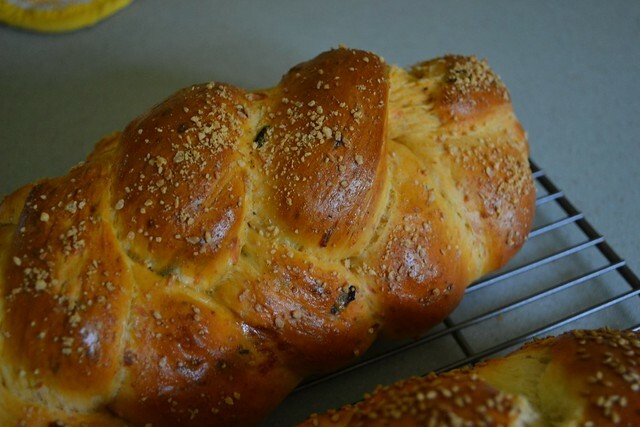 This bread had some rosemary and garlic powder needed it. Delicious! And didn't it turn out sooo lovely... didn't last long! 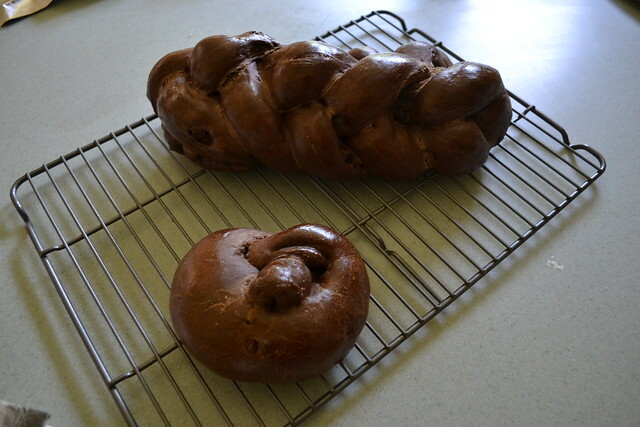 Double Chocolate Challah. I doubted myself whether it could actually be done. I love chocolate. I adore chocolate. 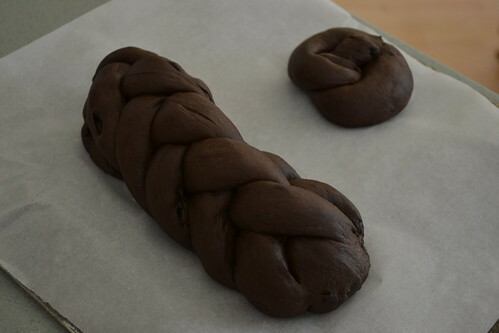 This is serious business, I told myself, making a chocolate challah. Could it be done? Still steaming! It fogged up the lens! Mix water together with yeast and 1 tbsp sugar. Allow to rest for around 10 minutes or until yeast creates little eruptions. 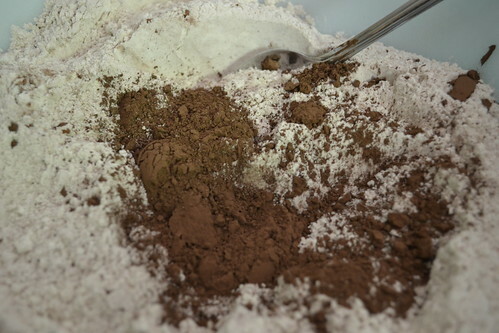 Meanwhile, mix together the rest of the sugar, flour, and cocoa powder in a large bowl. Add egg and oil to yeast mixture and stir gently. Add flour mixture. 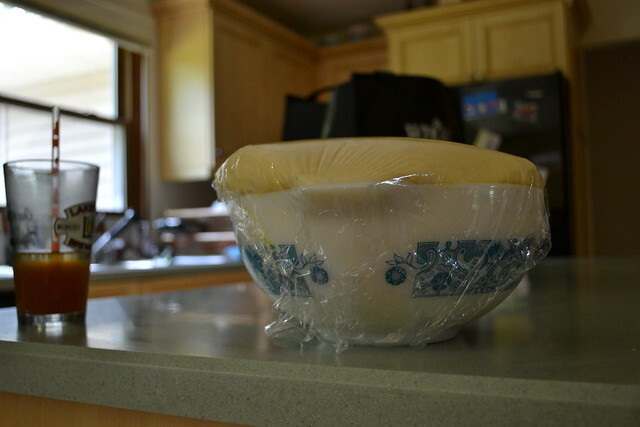 Knead by hand or with a stand mixer. 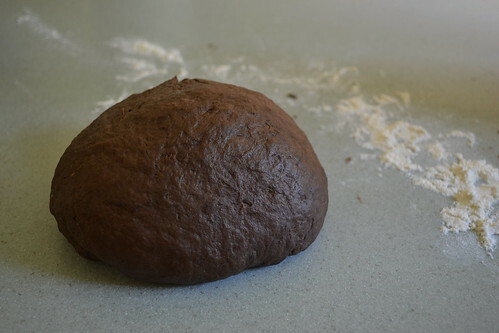 I ultimately had to add more water to the dough due to the added cocoa powder. I let my dough rise for about an hour and a half (I was in a hurry) it had nearly doubled in bulk. Punch down. 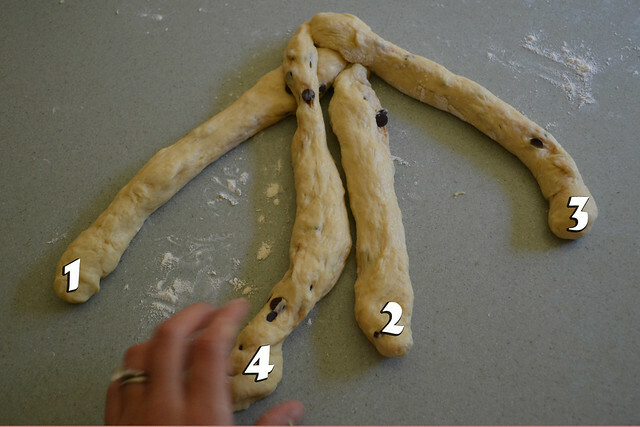 Separate into balls for braiding and knead chocolate chips into each strand. I add the chips here because I'm not crazy about chocolate chips on the outside strands, where they tend to break open and sort of burn. Braid and let rest for additional half hour. Egg wash. The Hazz and I, along with my mom, tried out the small roll we made as a sample. The verdict from all is, "Delicious." 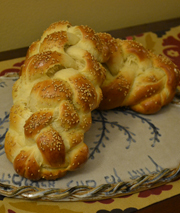 A warning, it's a little disorienting eating the challah. 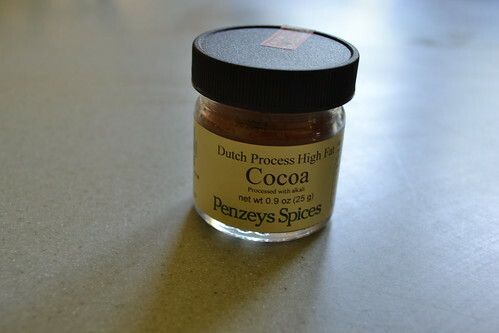 Because of the color and the aroma, you sort of expect chocolate cake. It's not that sweet. It's mild, rich, and delicious. 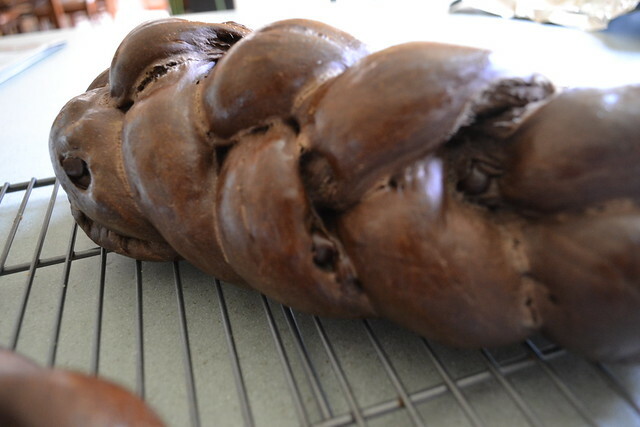 So, chocoholics... have you ever tried chocolate yeast bread? I'm curious to keep tweeking this baby. So, yesterday, I stood in the baking aisle of one of my favorite grocery stores for a good 10 minutes. It's not exactly the biggest grocery store in town, and I think I may have started to weird out the guy shelving the pasta sauce. After reading all the labels, I decided on a hippy dippy bag of flax seeds. Flax seeds are high in omega-3 and fiber! Yay! 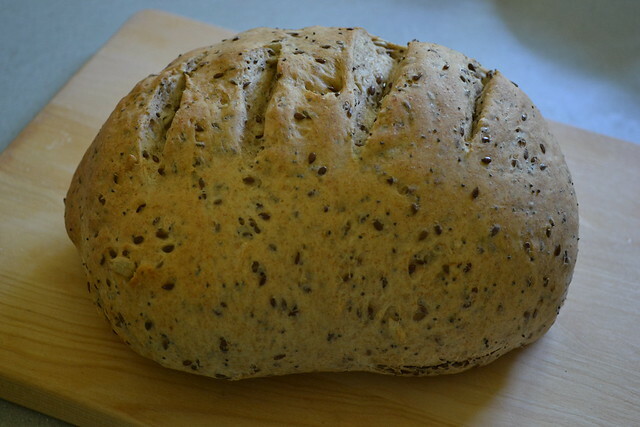 Thus, I present to you, a three-seed bread, dubbed Hippy Dippy Flax Seed Bread. Enjoy! This is a modification of the recipe I found on the bag of Bob's Red Mill Flax Seed. So, I'm not taking credit. I modified it though, so here's my method. Mix yeast and honey in very hot (but not boiling) water. Allow to rest up to 10 minutes or until yeast proofs and you see little "eruptions." Meanwhile mix together all dry ingredients. After yeast is proofed, add oil and mix with wooden spoon. 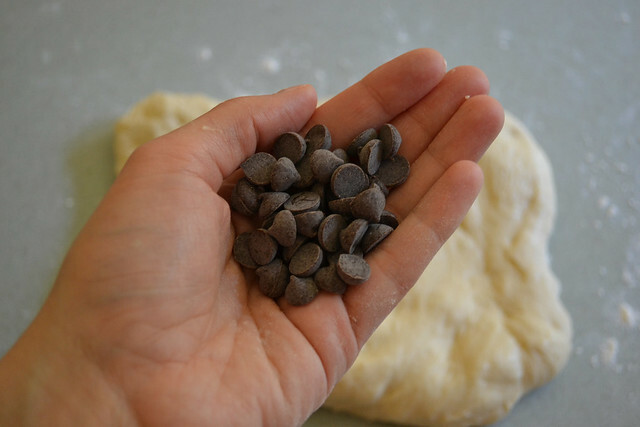 Add dry ingredients and mix by hand or with a dough hook on a Kitchen Aid. I usually use the dough hook until a ball forms and then throw it on the counter (literally, I toss it) and knead a bit by hand. 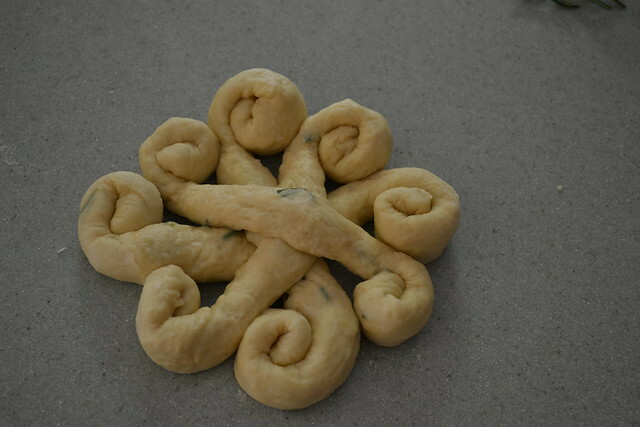 This dough rose REALLY fast. I left for lunch with my mom and returned in an hour and a half and it had basically grown out of the bowl. I'm not sure if that's just because it's very warm outside or not. I actually punched down and allowed dough to rise again. I almost never do this because I'm not convinced it does much. But, I didn't feel like baking the loaves quite yet. I think you could probably braid this bread, but I decided just to form it into a loaf and slash it right before putting it in the oven. Bake at 350 for 30 to 35 minutes or until internal temperature reaches 180 degrees. I'm still loving the pizza stone baking method, so it was a tight squeeze in the oven with our regular challah as well. Worth it. Enjoy it with all your hippy dippy side dishes like beans and tofu and mixed greens. Peace out! Look at this bounty!!! Today, I also experimented with fresh yeast. 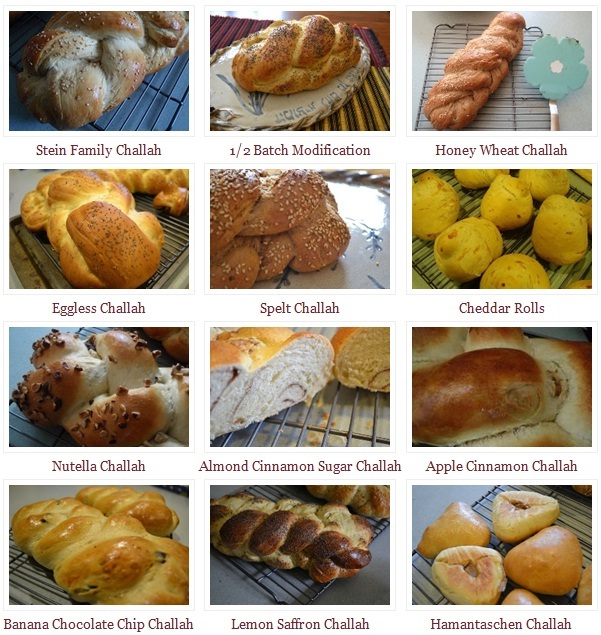 I'll update you all after I try the "regular challah" (challah is never regular! ).